The Knights Hospitaller, also known as the Knights of St. John, were established following the first Crusade to protect and treat Christian pilgrims in the Holy Land. They are recognizable by their black surcoat with a white cross./n/nGlory for God is not to be delivered only by the souls of the aristocracy, but so too by the grace of the common pious man, the Sergeant. 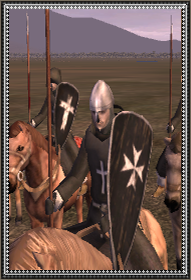 Unable to become a knight by merit of a plebian's birth, these brother-sergeants take to their vows with no less vigor and dedication, nor does their service as lighter cavalry diminish their quality. Amongst foes for whom light, nimble horse archers or lancers are their right hand, the use of a speedy cavalrymen able to chase down such aggressors is quite valuable.